We will repeat this successful tour from last September, this time in English. On Thursday 31 January, spaceandplace will make a walking experiment. 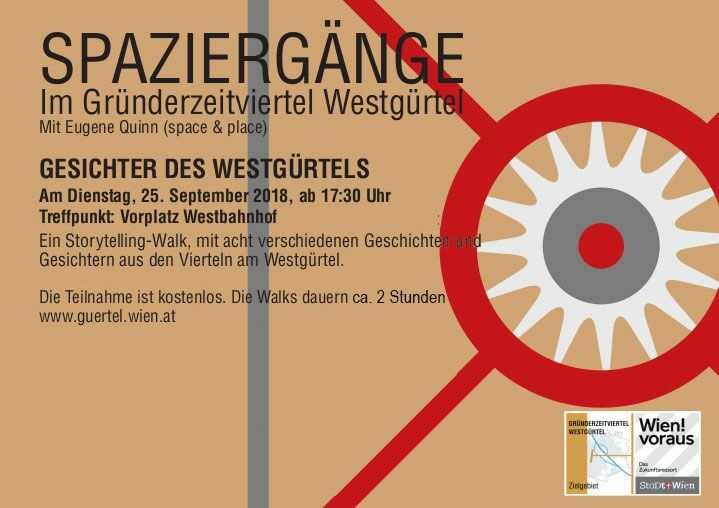 After our successful Summer tour (Secrets of the Westguertel), this time we will – instead of looking at buildings – meet people who bring this part of west Vienna alive. Rudolfsheim Fuenfhaus is the poorest, most ethnically-diverse and youngest Bezirk in Austria. It is often in the news for negative reasons. But we will go beyond the headlines and discover how life is there, in 2019. The tour is free, in cooperation with Stadt Wien, and the Vienna University Geography Department, and is led by Eugene Quinn. This urban exploration is part of a series of walks looking at this part of West Vienna, from the Donaukanal down to the Vienna River, on both sides of the Guertel. We want to explore the image and identity of the district (which has the same population as Salzburg, in an area one tenth the size of that city). It’s a storytelling project, looking at less well-known features of the area. We will look at the Guertel itself, the U6 and Westbahnhof, a co-working space, a new bar, a hotel, stylish energy-neutral student accommodation and a decorated Living Street.